[James] has an admirable home automation system which he’s been working on for years. It does things like monitor the state of the garage door, control the lights, and it even notifies him of a power failure. One thing that wasn’t on the system yet are the fireplaces he has in his home. The hardware you see above is how he patched into the fireplace remote control system in order to automate them. The remote control uses RF to communicate with a base station. Unlike controlling home theater components which use IR, this makes it a bit more difficult to patch into. Sure, we’d love to see some reverse engineering of the protocol so that a simple radio module could be used, but [James] chose the route which would mean the least amount of hacking on his part. He soldered wires onto the PCB for the buttons and connected to them using reed relays. These let the Arduino simulate button presses. With the rig connected to the home network he has a lot of options. The system can sense if the house is occupied. If it determines that no one is home it will switch off the fireplaces. [James] also mentions the ability to monitor for carbon monoxide or house fires, switching off the gas fireplaces in either case. We’ve all seen them – those fireplace DVDs that seem to pop up on grocery store endcaps and get traded in white elephant gift exchanges. If you don’t happen to have a fireplace in your home they might make a reasonable solution, but [Nick] from the Gadget Gangster thought it would be far better if you could create your own interactive digital fireplace instead. 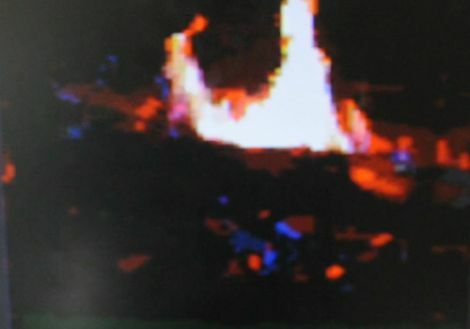 Using the Gadget Gangster Propeller USB platform and ProtoPlus board, his fireplace merges various video segments together based on user input, and plays them on any TV that comes equipped with RCA jacks. The process is fairly straightforward, and involves wiring up switches along with audio and video output to the Propeller board via the ProtoPlus board. The remainder of the work is done using software, requiring the user to select and encode video segments for storage on an SD card. [Nick] does however provide a whole set of clips for download, should you want to take the quicker route. After encoding and categorizing the video clips to coincide with the “stoke” and “add wood” user input buttons, the Propeller does the rest of the work, randomly selecting clips from the appropriate category when requested. The result is admittedly a bit Lo-Fi, though we thinks it’s cool and prefer to call it “retro” instead. It might not be a Hi-Def fireplace recording, but it’s far nicer to snuggle up to a hand made fireplace rather than a DVD you picked up as an afterthought. Continue reading to see a quick demo video of the digital fireplace in action.